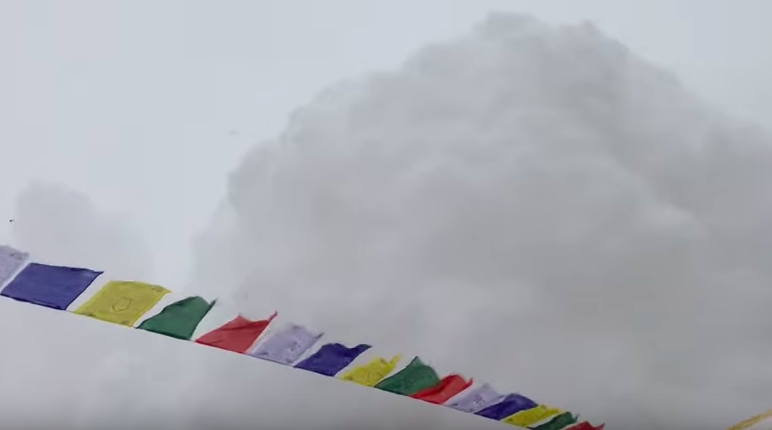 A shocking video has gone viral which shows the terrifying moment the basecamp at Mount Everest was hit by an avalanche. German mountaineer Jost Kobusch was at the camp on April 25, 2015, when an avalanche hit triggered by the Nepal earthquake. 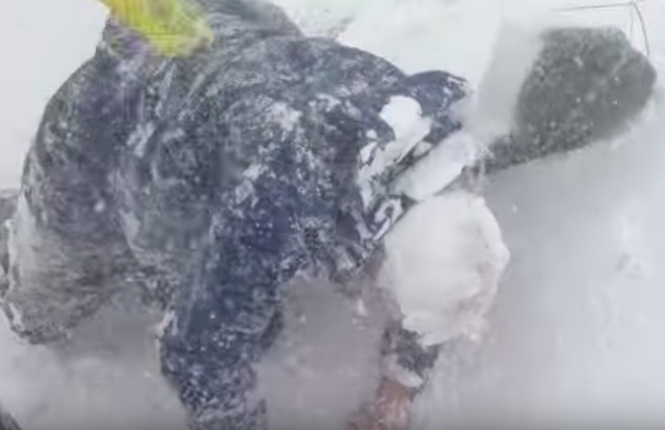 The footage he filmed shows a huge wall of snow quickly approaching before it suddenly hits the camp at full speed. At the start of the video Kobusch is filming the scene at the camp when he says ‘the ground is shaking’. As his companions nervously laugh at his comment, they spot a wall of snow approaching and realise an avalanche is incoming. Suddenly getting up and running for cover, Kobusch and another man take cover in a tent as the camp is hit. Once the coast was clear, the two men exited the tent and can be seen searching for somewhere safer to go. Although Kobusch and his pal survived, at least 22 other climbers died as a result of the avalanche in what was the deadliest disaster to take place on the world’s highest peak. 61 other people were injured. Kobusch spoke to Red Bull’s blog about the incident. I was sitting in the dining tent talking about conditions on the mountain and suddenly the tables started to shake. A friend of mine, a Japanese mountaineer, said ‘earthquake’. There was no doubt it was an earthquake so we went out of the tent. You have to imagine this is your home, at home you feel safe. Basically it was not fear, it was excitement – I’d never been in an earthquake. It was a strong one, the ground was shaking like I was on a sailboat in waves. We were looking to see if we could see an avalanche and laughing, having fun. It was at this moment where I took out my phone, thinking I would make a video for a blog and we can remember the day. Spotting people running away, Kobusch soon realised the situation was dangerous. I turned around and saw this giant avalanche coming towards me. It was big, I’ve never seen anything like it. It was like a tsunami. I didn’t run and was just asking myself if it would even make a difference if I did because the avalanche was so big. I didn’t move at all. At one point my brain switched to autopilot. Because everyone was running around me I just got a simple signal in my brain which was ‘Run, run, run and throw yourself behind something’. The camera was still running. When I saw this thing coming towards us I was pointing the camera and thought, ‘If this is going to hit us at least we’ll have it on video’. You don’t do rational thinking – it’s more of a mix between instinct and experience. The only thing I could think was ‘I’ll probably die now’. Surviving the incident, Kobusch stayed on the mountain for one more day before he took a regular flight to Kathmandu. The terrifying video has now reached over 23 million views.